Hate to break it to you. It may look like magic, but it is in fact, simply...makeup! Here's how every fit-gals worst nightmare plays out. You sweat, your pores open, makeup melts into your pores, your mascara smudges, suddenly you look like a hot mess and voila you've got a face full of nasty breakouts. Yuck! And yes, it's perfectly fine to just train bare-faced. You do you girl. BUT if you feel your best, most confident self with a touch of glam keep reading. The Best Kept Beauty Secret? Yep, you read that correctly. A makeup brand that you can wear to the gym, to work, even to dinner with friends, without the fear of caking, fading and breakouts. The best thing since sliced bread. If this is your first introduction to the fit-fam, welcome! We are a South-Australian-based vegan makeup brand that is revolutionising the face of fitness. Before you palm us off as another cliche makeup brand trying to sell you 'must-have' products destined for the deep dark depths of your 'meh' makeup collection, give us a chance. There are many things that are unique about Fitcover, but if we had to pick just three things here they are. After many years in the fitness industry our Founder, Nova Jane was sick of women having to choose between going bare-faced or training with makeup that would sweat off with the mere mention of sweat. There needed to be a better choice – and so we created it. Beyond being sweat-proof, we needed a product that women could wear all day long without a second thought into what nasty toxic ingredients might be seeping through their skin. The products we put on our face matter just as much as those we put in our green smoothies. Especially in gym-ready makeup. So, when it came to formulating our products we said 'NO WAY to nasties, give us Mother Nature’s best’. If you check out our ingredients here, you'll see that every addition is there for a reason. To enhance, to nourish, to protect and to leave your skin as fresh as a baby. That brings us to our next point! Owning great makeup and having great skin is a chicken and egg sort of situation. Great natural makeup leaves your skin nourished and healthy. And we all know, makeup looks one hundred times better on great skin. Just as, if you cover a congested face with nasty makeup, you're giving your skin a green light to go breakout-bonkers. Merely covering and concealing is soooo old school. Our products nourish and protect your skin giving it everything it needs to look flawless with, and without makeup. At age 20, or age 60. At your peak, and at that time of the month. So, do you want in on the fitness world's best-kept beauty secret? Check out our best-selling Active Mineral Powder Foundation to see why it's loved by active beauties such as Hattie Boydle, Hanna Oeberg and Paige Hathaway. And because finding your perfect shade can be a bit of a guessing game, we include 3 varying sample shades with every new foundation order. This way you can try your shade first and exchange your jar for free if you haven't picked the perfect match. We say the proof is in our pudding powder foundation....and in our mascara, serum and kabuki brush, but we don't want you to take our word for it. We've received so many raving reviews for Fitcover-lovers all around the world and we won't lie, we love showing them off. 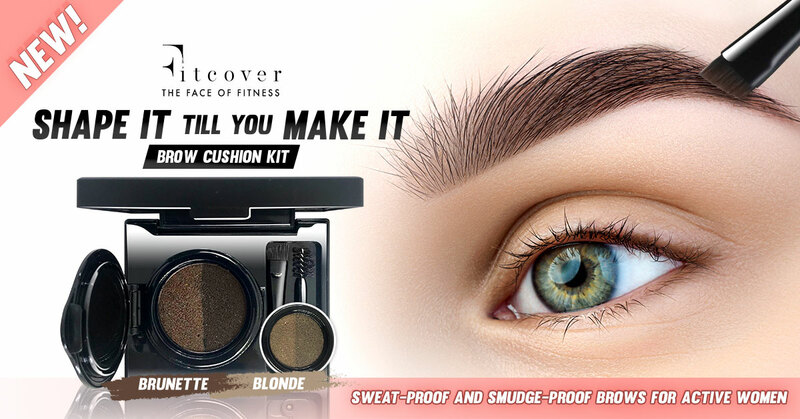 Check out our reviews to decide whether Fitcover is the right natural makeup brand for you!